Families come in all different shapes and sizes and as many of you will know, my family has changed shape considerably over the last couple of years. 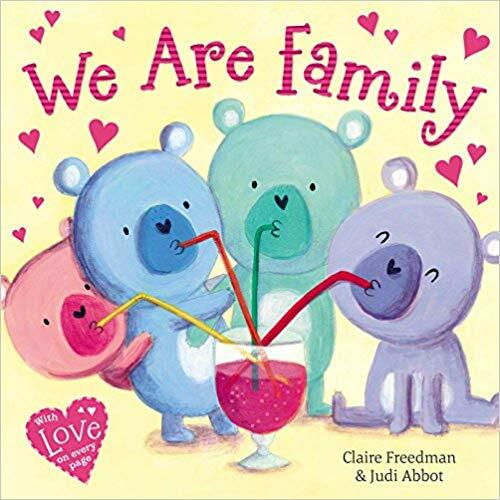 No matter what size or shape your family is though, the simple message of “We Are Family” is what trumps everything and that’s what comes across in this delightful book from Claire Freedman and Judi Abbot. Focussing on the bond between siblings it talks about all the fun things that brothers and sisters do together and how they stick up for one another. They may be some fallings out, but they always make up fast as underneath everything they are best friends. Little Miss C and Master C certainly have their ups and downs, but I know that deep down they do love each other and that becomes clear when you look at how they look out for each other and how they’ve stuck together through the ups and downs of the last year. Earlier this week Master C had a session with a speech and language therapist and one thing that melted me in the de-brief afterwards was when she said she spoke to him about friends and his understanding of friendship. She said that he talked happily about his friends from school, but particularly said that he wanted more friends like his sister. I still well up thinking about that. Bringing We Are Family into our home comes at a perfect time really as the pair of them will be welcoming a new half-brother or sister in the next couple of months. I know that it will mean changes to the family dynamic once again, but I’m hoping that reading this together will help them both see that it is an extension of their family rather than anything else. We Are Family really is perfectly pitched for children who may not have had a brother or sister before and are wanting to understand how much fun siblings can be. It’s beautifully written and Judi Abbot’s accompanying illustrations are gorgeous. We’ve recently shared a Claire Freedman book before, when we reviewed How To Nab A Rabbit, but this is a totally different style of book. That to me shows her versatility as a children’s writer, but also how having a range of books to read with your children is so important. Picture books can be shared not just for enjoyment, but also as a way of helping children understand different things happening in their lives. We Are Family was published by Simon & Schuster on 12 July 2018. Paperback ISBN 978-1-4711-1716-9 Priced at £6.99. It can be bought online via Amazon here. Disclaimer: We were sent a copy of We Are Family for the purposes of this review. All opinions remain my own. This post contains affiliate links.